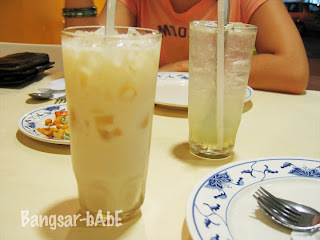 I decided to have Thai for dinner with Jeen last week so we headed to Thai Corner, PJ (Near the M.P.P.J building) dragging rif along so that we could order more dishes. 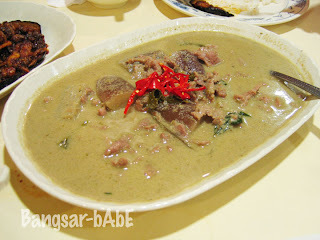 Once seated, I ordered the green curry beef, pandan chicken, brinjal fried with sambal belacan and tom yam. The curry was rich and generously flavoured with basil leaves. The beef slices and the brinjal chunks were deliciously tender. Although the curry looked light-coloured and creamy, it packed quite a punch. Compared to my previous visits, the curry was a bit too watery this time. The tom yam was quite good. 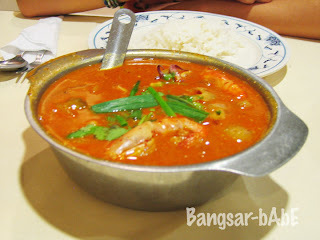 Sour, salty, sweet, spicy and piping hot, every spoonful was euphoria on that cold, rainy night. I did not eat the prawns so rif ate my portion. 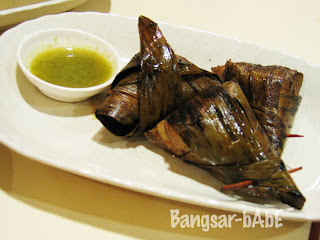 The brinjal fried with belacan was as good as I remembered. I always order this whenever I’m here. 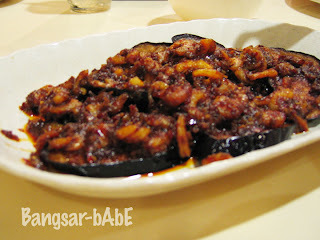 Soft slices of brinjal fried with dried shrimps and pungent belacan, it was perfect with fluffy white rice. 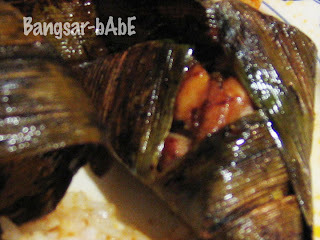 The pandan chicken was juicy, tender and well-marinated. Once unwrapped, it emits an enticing pandan aroma that tempts you to order another piece…when you have yet to start on the first. Tender chicken pieces beautifully caramelized with sweet marinade, I relished every bite! The bill came up to RM 63.14 after 5% tax and 5% service charge. Pretty affordable I thought. The only thing I wasn’t too happy about was the service. The staff were not attentive even though there were only two tables occupied (including ours) at that time. Verdict: Pretty good Thai food that won’t burn a hole in your pocket. Yes, i would agree with you that the bill was pretty reasonable for Thai food. hehe.. i dont mind bringing you there if you want and cancel our initial plan of going to shangri-la.. Cannot.. can only choose one.. i only work half a month this month.. so i dont get my full pay.. so how? which one you want?